Save on what is not important so you can invest in what is... This lesson is something I seem to relearn over and over again. This need to "save" money always tends to follow the belief that I don't have enough. Whether I didn't have enough to pay my bills, to purchase that amazing trip to Australia and swim with the Great White Sharks or order that authentic Star Wars Han Solo DL-44 heavy blaster pistol (It was the side arm of choice for smugglers and bounty hunters alike) each caused me much stress. The fact is, what was causing me stress and tension was the desire to have those things immediately taken care of. I, like many in our culture, am an immediate gratification junky. The bonus lesson is that when I am in a state of stress about money it is simply because I am focusing on what I lack and not what I have in that moment. This constant battle is one of the reasons I have been committing to these 30 Day Experiments. I have decided to do something about it, to take action. Several months ago, as I was coming up with ideas and content for my 30 Day Experiments, one of my categories was focused on financial experiments. Understanding that small changes can create huge impacts in our lives I concentrated my energy to look for the simple adjustments I can make and that is when this challenge hit me. As I was preparing to dive into 30 Day Experiment: No Diet Soda I realized this is a great opportunity to see how much I would save over the course of a month by saving the money I would have spent on purchasing that bubbly beverage. doled out to buy my favorite carbonated drink. At the end of the week I was shocked to learn I spent nearly $35 on soda alone. That means in a 52 week year I would spend nearly $2,000 and if I focused each week on saving the equivalent amount (Just $5 a day) I would SAVE the exact same amount! I don't know about you but, I can think of a handful of things I could buy with and extra $2,000! 1) Pick Your Saving Item - Pick something that you regularly partake in and spend your money on. It could be soda, coffee, cigarettes, cookies, magazines, iTunes, movies etc.... It should be something you buy on an almost daily basis. 2) Chart EXACTLY (Include Tax) - how much you spend over the course of week. Keep a log book, or chart it in your notes application on your phone. 3) Determine Your Monthly Savings Goal - Total up the dollar amount spent during that week and then multiply your weekly total by 4 weeks to get your monthly savings goal. 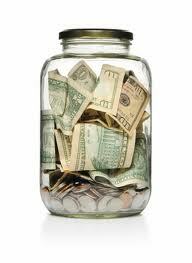 4) Save Amount Daily or Weekly - This is your choice. Decide in advance if you are going to be saving a set amount daily or if you are simply going to every week put the amount away. I like to pull out the weekly amount at the beginning of my week. I find it saves energy on having to do it every day. 5) Repeat As Long As You Want - I started this 3 months ago and continue t0 do this. In the short term I am not saving much, but in the long run I know it will make a big impact. It will for you too!! Notice, I did NOT say give up any of these items but, just be willing to save the same amount each week that you would spend on that item. That seems fair to me and hopefully to you as well. Interestingly, you may decide to reduce the amount of spending like I have. Maybe not. Even though I haven't quite given up soda completely, I did come to the realization that I spent way too much and have saved even more as a result. I am very excited to see this come together in the coming months!! This is definitely an experiment I am keeping and in conjunction with several others of my financial experiments, I should start seeing some nice savings as the year progresses. I would love to hear your stories and other ideas of how you found ways to save your own version of "soda money".